I couldn’t think of a better way to celebrate my 200th post than with a game of dominoes. 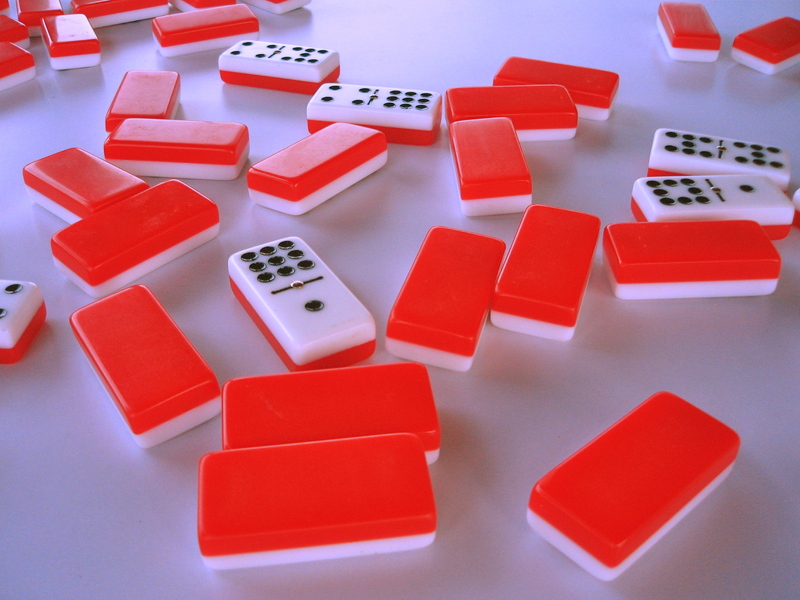 Growing up Cuban, we loved playing dominoes when we were kids. Our grandparents were happy to have us quiet and entertained for a couple of hours and we were happy to swirl the clacking tiles around the table, dunking oreos in milk between matches, and enjoying the late of hours of a Sunday afternoon. Then we got older and everything changed. No longer at the kids table, we might venture into a vacant chair after dinner or during a family vacation to play with los viejos, but it was a different story. Trying to keep up, you may set your piece down but lived in fear of “the look” from your partner across the table (the one who got stuck with you). A look that asked why, oh why would you put that piece down? Not one for strategic thinking, I never had an answer. The other team would laugh and reap whatever reward your mistake allowed. The game was the same but the expectations were higher. This past Christmas, I took my place at the dominoes table once again. I’d traded my milk for wine but still liked swirling the tiles, the moment when one game is over and another is starting, and loved being in the game. Newly obsessed, when a friend asked me to make a cake for his partner’s birthday a few weeks ago, the elegant black and white cake with three layers of pastry cream I’d planned, went square and turned into a domino. Past the age where you can celebrate staring 40+ candles in the face, I thought it would be a fun way to hide his true age in plain sight. One cake would have been too obvious so it became three — would he be turning 24 or 42, 27 or 73, 35 or 54? After that, I couldn’t resist going for a whole set of double-6, this time petits fours with guava filling and a lime glaze. Set on frilly cupcake liners they can glide across the table for a quick game. 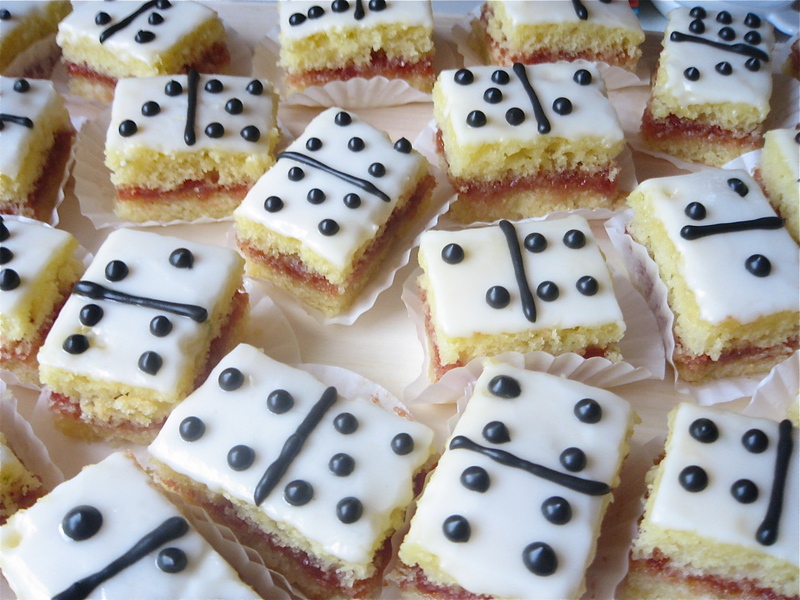 I wouldn’t suggest rapping them twice to skip a turn, flicking them across to your partner to set down for you, or slamming them on the table when you have “domino!”, but whatever tiles your left with, you can eat. My dominoes, my rules. When I decided to take a break last week, I wasn’t sure if my 200th post should come just before or just after. Is it the end of the round or another just beginning? Going through my site this past week, I still didn’t detect a strategy but could definitely see how one post lead to another and another. I’m looking forward to the next hundred and hope you’ll keep reading and commenting because I’m still very, very hungry. 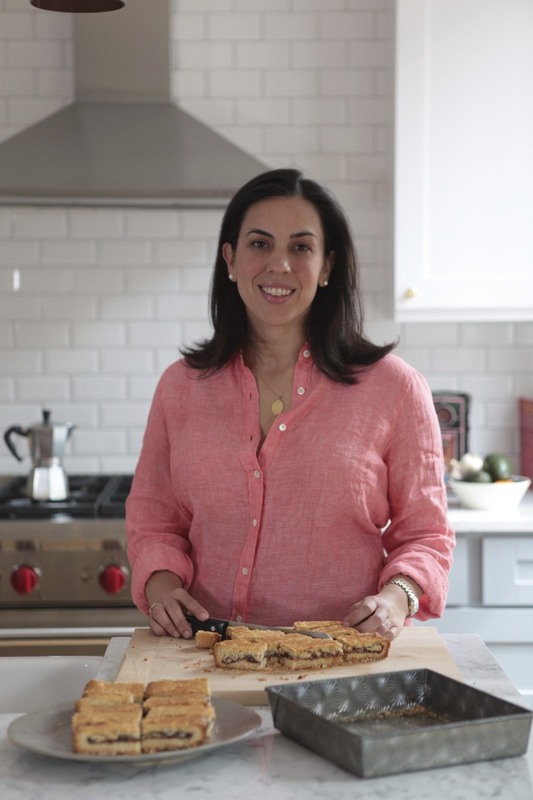 This recipe started with Dorie Greenspan’s Black & White cake from Baking: From My Home To Yours, one of my favorites, so I adapted part of it for the cake layers. I was just short of my usual cake flour and used an unbleached King Arthur cake flour for the first time. 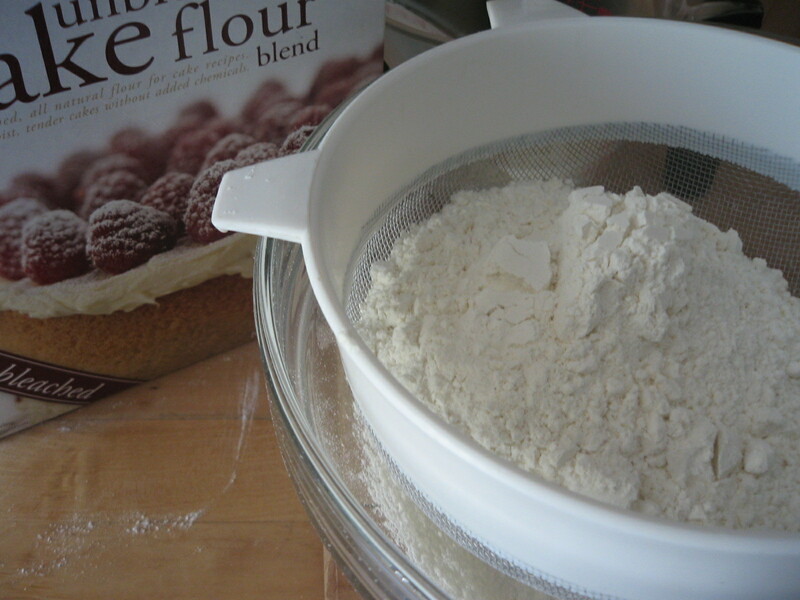 While regular cake flour promises a finer texture, I found this cake just as light and I loved that it didn’t have the metallic, chemical scent of bleached cake flour. I’ve noticed that more stores are carrying it, and it’s definitely worth trying. Preheat oven to 350°F. 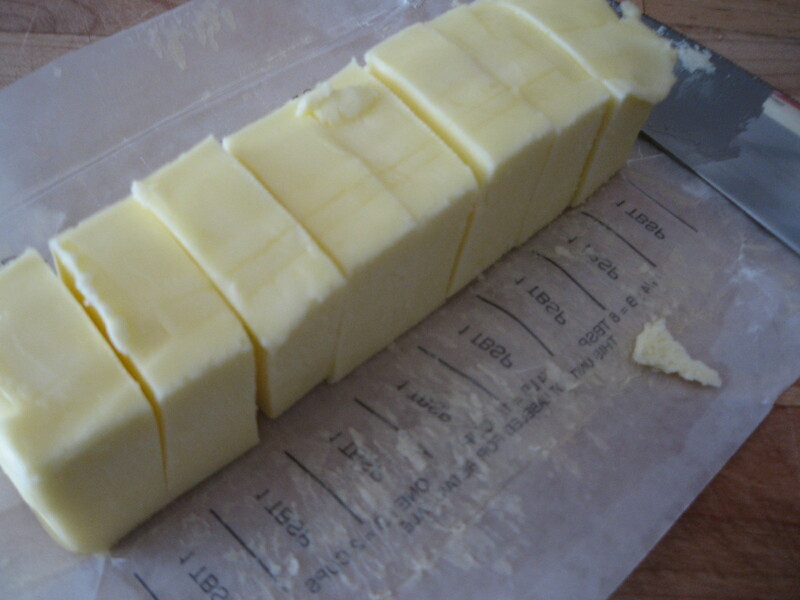 Butter a 9-x-13 sheet pan with butter and dust inside with flour, shaking out the excess. Line with parchment paper and set aside. Heat guava preserves over medium heat until smooth and spreadable, about 5 minutes. Remove from heat and set aside to cool. 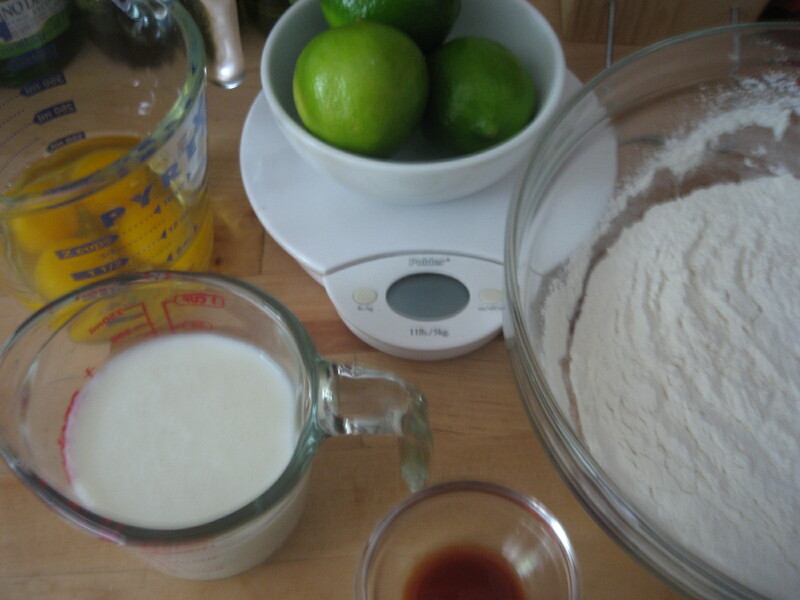 To prepare the syrup, combine the lime juice and sugar in a small saucepan over medium heat. Stir until sugar dissolves. Add zest if using and set aside to cool. 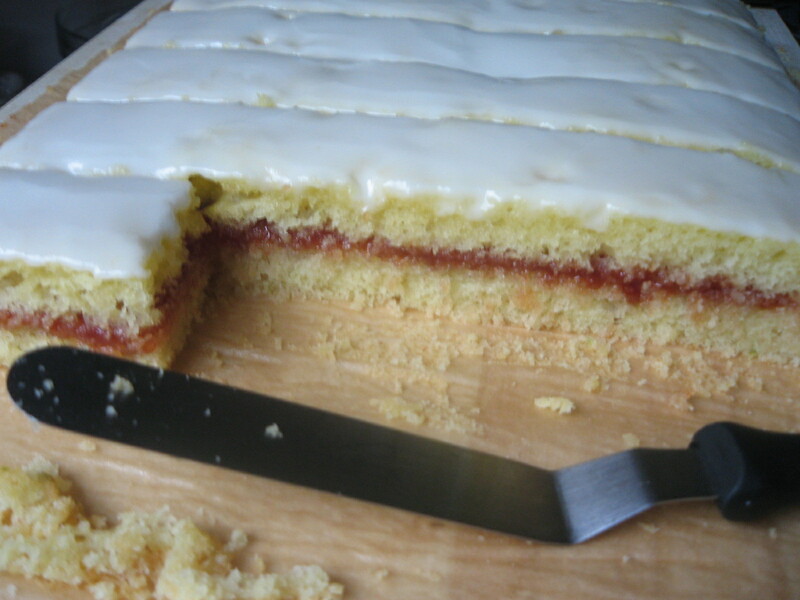 Using a long serrated knife, slice cake in half horizontally. Set aside top layer. 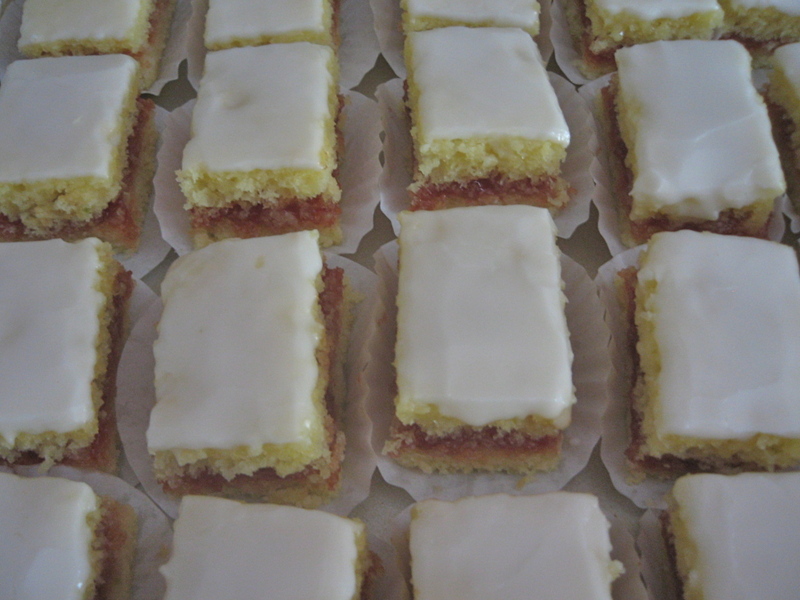 Lightly brush bottom layer, cut side-up with lemon syrup. (Use syrup sparsely, no more than 2 tablespoons). 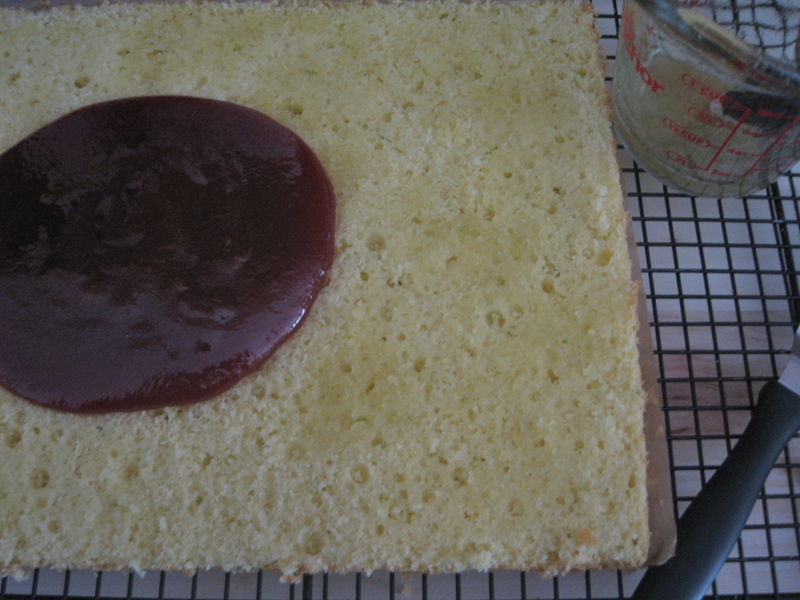 Cover cake with cooled guava preserves and top with remaining layer, cut-side down. Sift confectioner’s sugar into bowl. Strain remaining syrup into confectioner’s sugar and beat on low speed until smooth. Set apart 1/4 cup of the glaze. 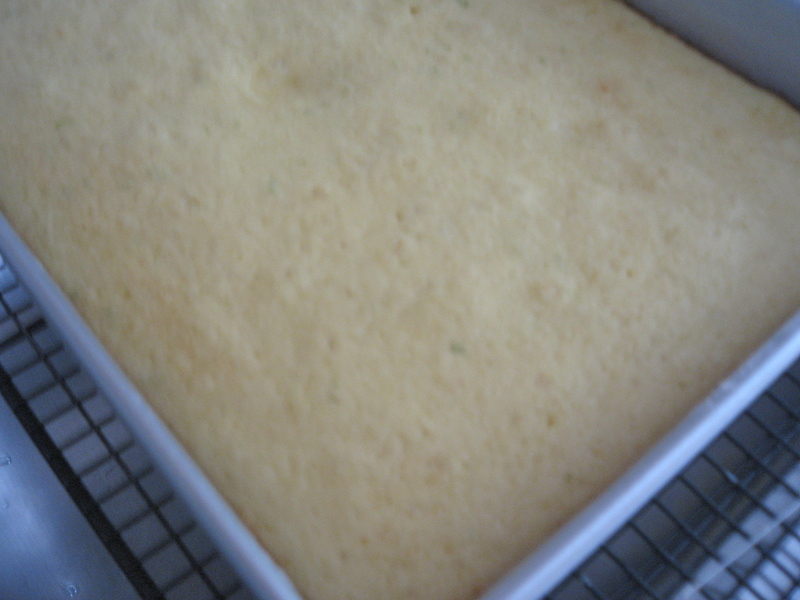 Ice cake with remaining glaze and allow to set for 20 minutes. Using a serrated knife, carefully trim ends from cake and cut into even squares. 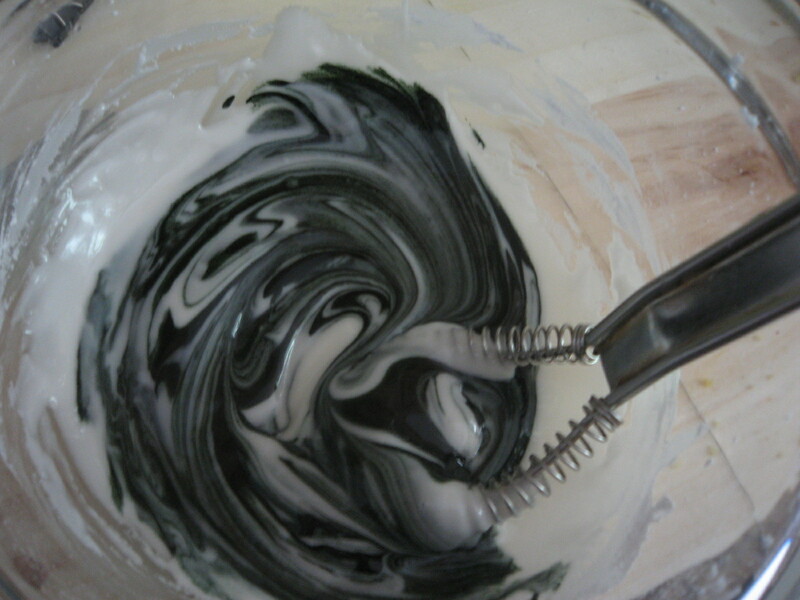 Add gel coloring, no more than one drop at a time, to remaining glaze until desired shade. 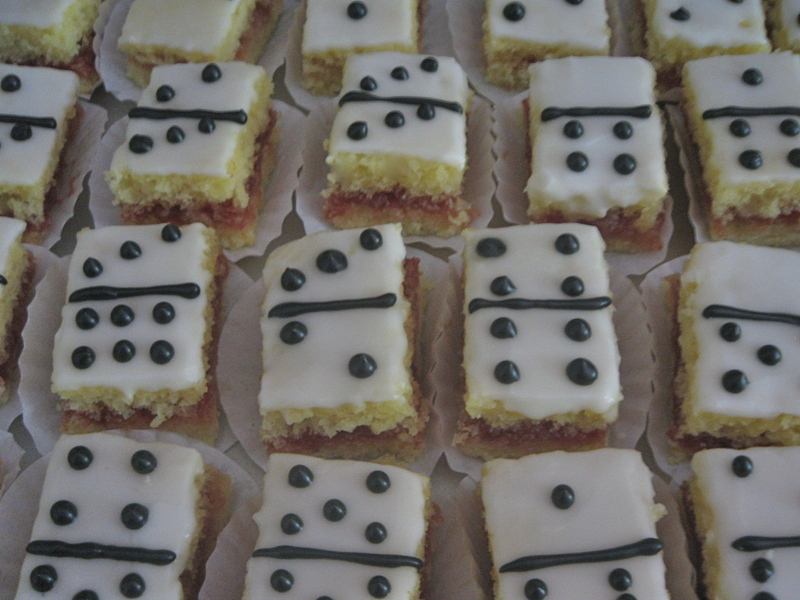 Using a pastry bag fitted with a small tube attachment, pipe black icing onto cut squares to make dominoes. Keep decorated petits fours refrigerated. Take out about 20 minutes before ready to serve. 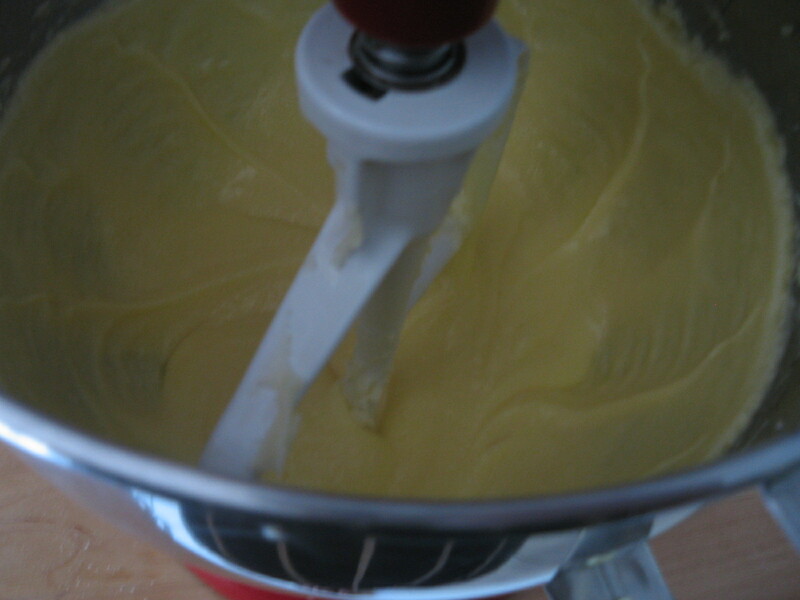 *I usually fold in the dry/wet ingredients by hand then mix on low speed for a few seconds until just combined. **At this point, the cake can be well covered in plastic wrap and frozen until ready to use. wow. some pretty amazing cake! looks yummy. Wow, Ana! I would love to try to make these! Make me wish I weren’t a Vegan! Yummmmmmm. Ana, these are so incredibly cool! I love them. This would totoally get you on Martha Stewart. Nice Ana! 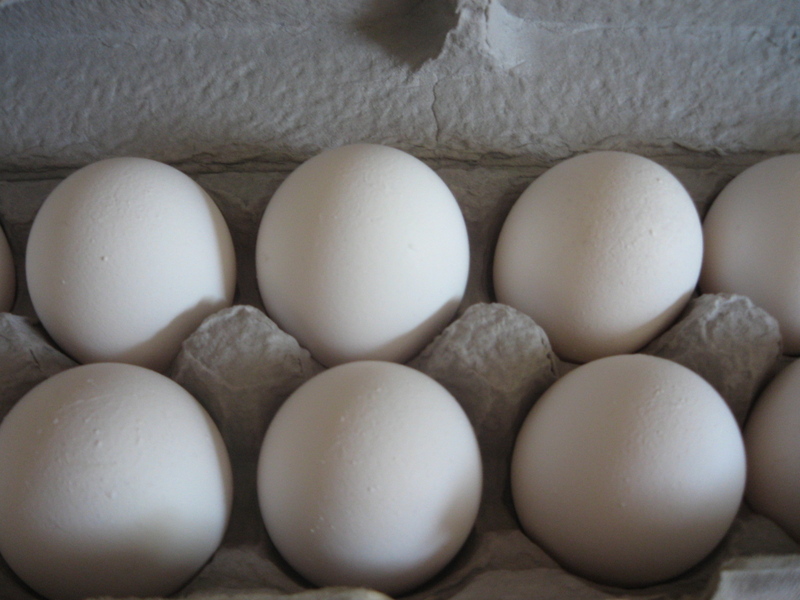 I’ve seen something like this at an Italian bakery and I’ve always wanted to make them. Now you’ve given me no excuse but to try it out and the guava filling just makes it 100 times better. Congratulations on your 200th post! Ay, mi madre! What an amazingly wonderful thing this is. It is too early in the morning for me to be this hungry for guava and frosting!